What do you know of science-based style? The Boston Museum of Fine Arts has a fantastic exhibit on Tech Style until July 10th. It examines the collaboration of technology and scientists working with designers to create fashion in new ways. Fashion in 2016 is so much more than a traditionally woven fabric pushed through a sewing machine. The show has great pieces of 3D printed looks (with Iris Van Herpen yet again). There were also shoes. 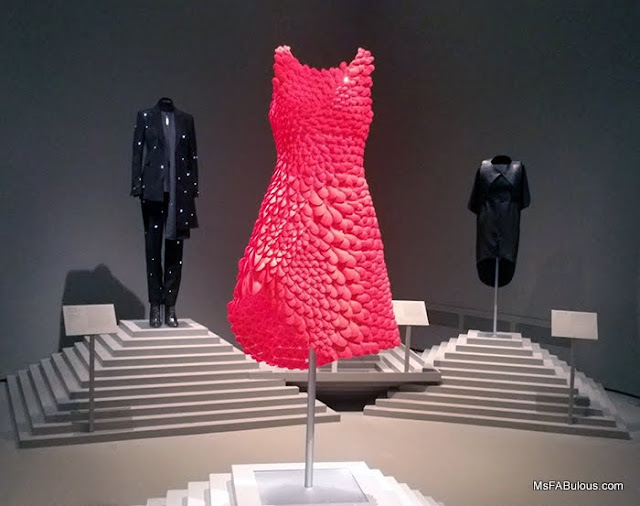 Not only can 3D printing create fully wearable sculpture, but also elements to create a flexible textile. The red dress at the top was inspired by the nervous system by designer/biologists Jessica Rosenkrantz and Jesse Louis-Rosenberg. The individual cells of the dress can be customizable in shape and direction to best flatter and move with the wearer. Then there were the outfits wired with tech as a different ornamental element. There was a dress with programmable digital patterns that you change on a whim. There was a suit with embedded lighting and Hussein Chalayan's robotic outfits where parts of the dress could move on their own. Other embellishment techniques included intricate digital printing from Alexander McQueen and Mary Katrantzou. Laser-cutting was showcased beautifully in a Manish Arora top. One of the wittiest dresses was the Viktor & Rolf piece that took the idea of "wearable art" literally. The technically advanced bonded fabric formed a framed flat piece of artwork when hung up on the wall, but would conform to the body when worn. 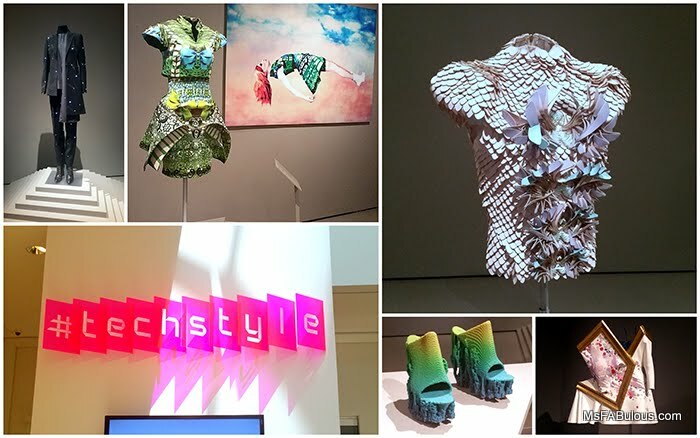 If you liked the Metropolitan Museum of Art's Manus x Machina exhibit, the #techstyle show was a deeper dive into how technology is shaping modern fashion design. It takes a lot more than mere science and technology to make fashion beautiful. This exhibition was a great example of the best of both worlds.